The Orbital Sciences Corporation Antares rocket is seen on the Mid-Atlantic Regional Spaceport (MARS) Pad-0A at the NASA Wallops Flight Facility, Tuesday, April 16, 2013 in Virginia. Liftoff is set for April 17. WALLOPS ISLAND, Va. — A new private rocket called Antares is poised to blast into space for the first time today, potentially marking a giant leap forward for the emerging commercial spaceflight industry. The Antares rocket is slated to lift off at 5 p.m. EDT (2100 GMT) Wednesday (April 17) from Virginia's Mid-Atlantic Regional Spaceport (MARS), on a test flight designed to pave the way for unmanned cargo missions to the International Space Station. This map by Orbital Sciences Corp. shows the launch visibility possibilities for Orbital's Antares rocket on April 20, 2013. The rocket will launch from NASA's Wallops Flight Facility on Wallops Island, Va.
"A lot of people say that the American space program is in decline," Phil McAlister, NASA's director of commercial spaceflight development, said Tuesday (April 16) from the agency's Wallops Flight Facility, where MARS is located. "Well, you only have to go a couple of miles down the road to see it on the rise, literally." Today's test flight will mark the biggest rocket ever to fly from Virginia's Eastern Shore and Wallops Island, which is NASA's launching ground for small sounding rockets. The launch could be visible from a wide swath of the U.S. East Coast, reaching as far north as Portland, Maine, and as far south as Charleston, S.C. You can watch the Antares launch webcast live here at SPACE.com, courtesy of NASA. "This is a big event for the Eastern Shore for Wallops, and for everybody in the surrounding area and, I think, for everybody in the country," Orbital executive vice president Frank Culbertson, general manager of Orbital's advanced programs group, told reporters Tuesday. NASA is counting on Orbital and SpaceX to fill the cargo-carrying void left by the retirement of the agency's space shuttle fleet, which was retired in 2011 after 30 years of spaceflight. Orbital signed a $1.9 billion contract with NASA to fly eight unmanned supply missions using Antares and a spacecraft called Cygnus under the space agency's Commercial Resupply Services program. California-based SpaceX got $1.6 billion for 12 flights with its Falcon 9 rocket and Dragon capsule. SpaceX has already flown two of these contracted missions, delivering cargo to the orbiting lab in October 2012 and then again this past March. Dragon also visited the station on a demonstration flight in May of last year. 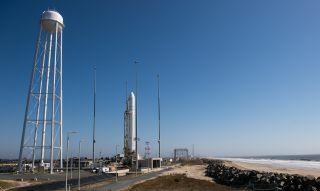 Orbital Sciences is already prepping a Cygnus for a demonstration mission to the space station, which could blast off by late June if today's Antares launch goes smoothly. The first official Cygnus cargo mission could then follow by year's end. "It's being sent off to the fueling facility to get fueled, because the cargo's already packed," said Orbital spokesman Barron Beneski, explaining that Cygnus will carry about a half-load of cargo up to the station on its maiden voyage. The progress made by both SpaceX and Orbital shows that NASA's decision to rely on commercial cargo providers was a good one, Beneski added. "I think it validates the approach that NASA has taken," he told SPACE.com. "For the government, I think this is a very good business deal on their part." NASA also wants private American spaceships to start carrying its astronauts to and from the orbiting lab by 2017, ending its current reliance on Russian Soyuz spacecraft for this taxi service. SpaceX is working on a manned version of Dragon in the hopes of scoring a NASA crew contract. Other major contenders are Boeing and Sierra Nevada Corp., which are developing a capsule called the CST-100 and a space plane called Dream Chaser, respectively. "I think what this shows you is that there's no one way to do spaceflight development. There's no one business case," McAlister said. "There are multiple approaches and multiple strategies and philosphies that can work. We have this competitive environment and they are free to innovate." From start to finish, today's test flight will last about 18 minutes. It should take the Antares rocket, however, about 10 minutes to deploy its payload — a dummy version of the Cygnus spacecraft — after launch. While Orbital is targeting a 5 p.m. EDT (2100 GMT) liftoff, the company has a three-hour window in which to launch the Antares rocket. Currently, there is about a 45 percent chance of good weather at launch time. The potential for thick low clouds — NASA has a visibility requirement for the flight — and rainstorms are the only concerns. Orbital would try again on Thursday (April 18) if weather delays today's flight. A mass simulator is designed to mimic the weight of a real cargo ship. Image released April 11, 2013. The Antares rocket is a two-stage booster that stands about 131 feet (40 meters) tall and is powered by two Aerojet AJ26 liquid-fueled engines that are modernized versions of engines originally built to launch Russia's N-1 moon rocket in the 1960s.The second stage is a solid-fueled rocket motor built by Alliant Techsystems (ATK), the same company that built the rocket boosters for NASA's space shuttles. The rocket, Culbertson said, will appear to take its time launching off the pad before streaking spaceward on a southeastern trajectory that carries it out over the Atlantic Ocean. Since the launch will be visible from Washington, D.C., Orbital officials have provided viewing guides to members of Congress to help lawmakers see the launch, and will host an event at the company's office near the Capitol. Orbital Sciences picked Antares as the new moniker for its Taurus 2 rocket, a new medium-class booster initially slated to launch the firm's unmanned Cygnus spacecraft on space station cargo flights for NASA. Image released March 2013. "'My confidence level is very high," Culbertson said. "I think we're going to see a nice show and I feel great." The target orbit of the Antares rocket is a path that alternates between 155 miles (250 kilometers) and 188 miles (303 kilometers) above the Earth. The dummy Cygnus vehicle should stay in orbit for about two weeks before burning up in Earth's atmosphere, Culbertson said. Before burning up, however, the Cygnus mass simulator will deploy several tiny satellites for NASA and a commercial client. The small nanosatellites include two versions of coffee cup-size Phonesats for NASA's Ames Research Center and the Dove-1 nanosatellite for a commercial customer. Culbertson said today's launch will likely be the loudest rocket ever to blast off from Wallops Island, which is flanked by a national wildlife refuge. "We'll try not to disturb the crabs and oysters," he said with a laugh. Editor's note: If you snap a great photo of Orbital's Antares rocket launch that you'd like to share for a possible story or image gallery, send photos, comments and your name and location to managing editor Tariq Malik at spacephotos@space.com. Visit SPACE.com for complete coverage of the Antares rocket launch on Wednesday. This story has been corrected to reflect the proper title of Orbital's Frank Culbertson, Executive Vice President and General Manager of Orbital's Advanced Programs Group. Mike Wall contributed to this report from San Francisco. Email Tariq Malik at tmalik@space.com or follow him @tariqjmalik and Google+. Follow Mike Wall on Twitter @michaeldwall and follow us @Spacedotcom, Facebook or Google+. Originally published on SPACE.com.